Through careful juxtaposition of Western and non-Western elements, Iranian artist Kamrooz Aram raises questions about the connections, hierarchies, and roles of visual culture in the modern era. 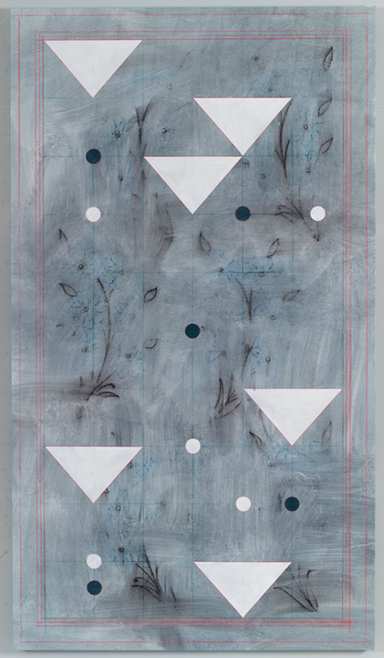 In Ornamental Composition for Social Spaces 19, Aram lays out a floral pattern found in Persian rugs on a grid across the canvas, at times erasing or wiping it back off the surface. Laid out on the same grid are triangles and dots — geometric shapes that appear in a variety of visual sources from Persian stucco design from the 13th and 14th centuries to Suprematist painting from the early 20th century. Aram’s mix of visual elements feels truly of the moment, where we experience the world as a clash of imagery from a variety of cultures and time periods, and where the lines between art, decoration, and ornament are blurrier than ever. Aram’s work has been included in solo and group exhibitions worldwide and can be found in the public collections of Metropolitan Museum of Art, New York; Modern Art Museum of Fort Worth; Cincinnati Art Museum; and M+, Hong Kong. Websites: Kamrooz Aram, Green. Art. Gallery.